The good old 3-d glasses. As good a retro-peripheral as they were, there were only a handful of games released for them. This meant that in order to get your value from the cool specs you felt that you had to practically buy every game. Which is why I ended up with Zaxxon 3d. I'd never played the coin-op and wasn't overly inspired with the screenshots on the box. I bought it because I had to because, well, it’s was 3D!!! Obviously I'm now familiar with the arcade game. The first thing to mention is that it is not really a direct conversion. The arcade game was an early isometric 3D shooter. In order to make more use of the 3D glasses, the game is now fully 3D with your ship flying into the screen. Each stage is basically split into three parts. 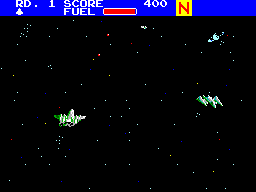 First you have to negotiate your way through a wave of enemy fighters that fly towards you. Then you enter the enemy base. Here tanks, walls, rockets and forcefields all block your path. You also need to keep an eye on your ever-depleting fuel gauge. This can be topped up by shooting fuel canisters in the base. Finally you meet the end of level boss. Once he's defeated you move on to the next round which is roughly more of the same but a bit more difficult. ....Graphics! To continue what I was saying about the Gameplay, I lost most of my lives by hitting the forcefields in the base. 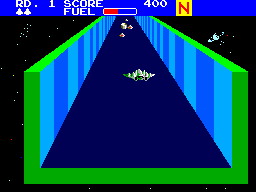 These were obstacles which required you to spot the 'gap' in them and fly through them. However as they were very pale and hardly visible finding the gap was a frustrating matter of shooting at the forcefield until you bullets finally found the hole. Very irritating i can tell you. Zaxxon doesnt make for great viewing. The first thing you notice are that the sprites lack much detail. The ships and tanks are all very pixelated and blocky. Speaking of which, the walls and barriers in the base literally are blocks. It's like you’re flying through a Lego base! The overall graphical look of the game is disappointing. The 3D effect does try and pull it through somewhat. The stars in the background of phase 1 seemed to sink back into your TV nicely and your ship seemed to hover slightly out of your screen. The effect is also quite good in the base phase of the game. Unfortunately this doesn't save Zaxxon from being a very poor looking game. The title screen has a rather weak tune which doesn't inspire you to want to play much. However it gets much better from there on. Each round consists of three different tunes. The tunes during the base and the boss sections are good and contribute to the atmosphere of the game. However my fave is the fast-paced ditty which accompanies the first phase of the game where you fight the waves of enemy ships. It's one of those tunes that sticks in your head for quite a while after playing. The sound effects are nothing spectacular but contribute quite nicely. Your ship is easy to control. Basically just the touchpad to move and the one button to shoot. The best way of describing the control you have over your ship would be smooth but sluggish! Because the game is slow paced the movement of your ship is quite slow. To get from the left of the screen to the right of the screen can take about 3 seconds which is not good for a shooter. I believe there are nine rounds before the game starts again even harder but i never got that far. The games difficulty level is enough to stop you finishing it straight away but not enough to make you tear your hair out (except for the forcefields!). The big downside is that there's not much in variation between each level. Even a change in the colour of the base walls would have given a little something to make it look a bit different. The only reason to come back often is if your playing it on a real master system with the 3D glasses. As I mentioned earlier, with not many games available people will need to make use of the ones that there are. 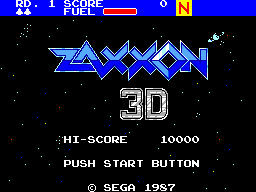 If you do have the glasses and haven't got Zaxxon 3D then I suppose it is worth finding it just to get it in your collection.